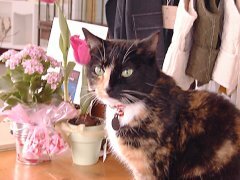 "Miss Snoops has worked at The Jealous Gardener since April of 2001. Sadly, her person passed, and Snoops was one of seven kitties who needed new homes. 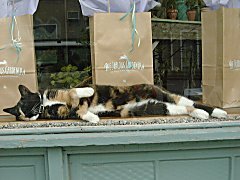 All the kitties have new homes now, and we are fortunate here at The Jealous Gardener to have Miss Snoops as our shop cat and local celebrity. Her Royal Highness Miss Snoops main duty is to sit on the desk and be adored by her loyal subjects. Sometimes she fancies a nap, but the better part of her day is meeting and greeting her public and receiving pets and kisses. A local celebrity, Miss Snoops has appeared on the local news, and in our television commercials and newspaper advertising. And as if shes not busy enough, she has a page on The Jealous Gardener web site called Ask Miss Snoops where she answers hundreds of e-mails pertaining to everything from garden how-tos to help with punctuation! I dont know how she does it all..." Story and pictures sent in by Chris Bolesky of Portland, Oregon. Note: Miss Snoops passed away early in 2004. She will be missed by staff and friends who came to visit her, as well as others who loved her.